Well, we've just about finished the packing now. 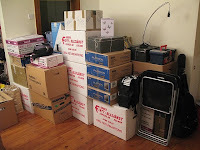 A few essentials are left (TV, DVD, laptop, microwave...) but almost everything else is boxed up and ready to go. We've even got the champagne on ice! My friend Jouko is sickened by this (the planning, not the champagne), maintaining that you shouldn't start packing until the night before the move, but he spent all night packing before going straight into the move with no sleep last time he switched flats, so I don't pay his advice any great heed.